​1. Pianist/composer Nikki Iles’ lyrical playing and ability to inhabit any style with conviction is a joy. Her collaborations with great singers Norma Winstone and Tina May make her the most sensitive accompanist and I’m very much looking forward to singing her evocative seascape song ‘Tideway’ co-written with Norma. 2. Nikki and I will also play a UK premiere of ‘From Me To You’ co-written with my Songbook partner Alan Broadbent. It’s my tribute to my late father-in-law whose astute advice and loving support I miss dearly. 3. 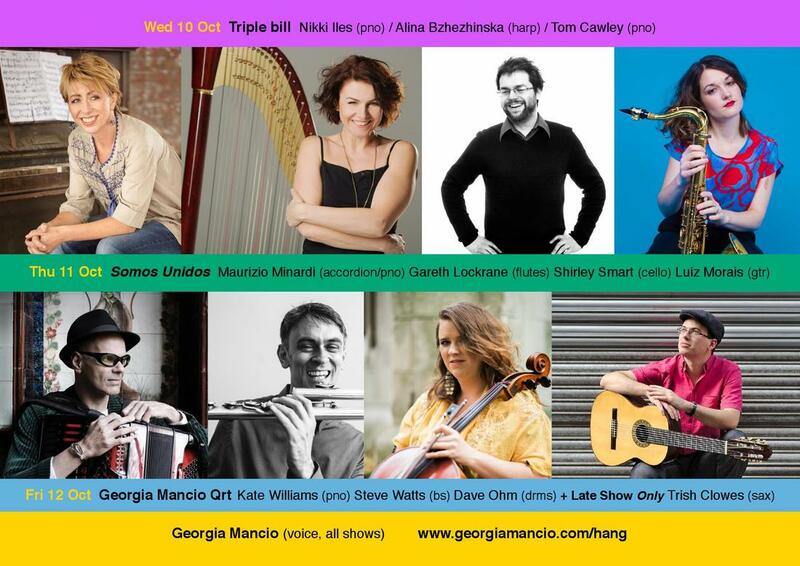 Alina Bzhezhinska will make you reappraise the use of the harp! With years of experience as a classical musician, her take on Alice Coltrane and beyond have deservedly seen her meteoric rise on the jazz scene in just the last couple of years. 4. Abbey Lincoln - a stunning vocalist, searing performer and deep and underrated writer, Alina and I will play a set of her songs and pay tribute to this important artist. 5. Award-winning stellar pianist Tom Cawley is also the most incredible and versatile songwriter. 4 years ago for our ReVoice! Festival set he suggested we co-write some original songs and we’re thrilled to present them again (and more) at Hang. Tom has stunningly set my quirky character-driven stories to music and gifted me another very different angle in my journey as a lyricist. 6. Tom and I will premiere ‘Mary’ - a portrait of my maternal grandmother whose Aryan looks and perfect German allowed her to fool the Nazis and smuggle messages for the Italian Partisans aged just 19. 7. Maurizio Minardi - this lauded accordionist, pianist and composer moved to Paris 2 years ago. I’m delighted that his first UK return will be at Hang, reminding London audiences of his virtuosity and musicality. 8. Cellist Shirley Smart with her lush, rich sound, immense imagination and well informed grooves make for the ideal collaborator. A musician of great depth and scope, she finds the truth in every song. 9. Flute supremo Gareth Lockrane played on my very first album Peaceful Place (2003) and we’ve collaborated many times since. A hugely respected soloist, bandleader and jazz educator, his talent and positivity are irresistible to all. I grab any opportunity to hear him and I think audiences feel the same. 10. Luiz Morais and I met when we did a skills swap: I gave his wife voice lessons and he attempted to teach me Brazilian Portuguese. In the end we started playing together instead which has been an equally valid education. Prepare to be seduced by the beauty of the 7 string guitar and the deeply grooving way Luiz plays it. 11. Collectively me, Maurizio, Gareth, Shirley and Luiz ‘Somos Unidos’ - meaning we are united, we are together. In a time when politicians would have us believe we are better off going it alone, this night of European and Latin music is a celebration of diversity, unity and multi-culturalism. 12. Pianist/composer Kate Williams and I have worked together for over 15 years, culminating in the recording of our new album Finding Home last month. Her credits are testament to her wide-ranging talents - from Stan Sulzmann, Chris Biscoe, Pete Hurt’s Orchestra and the late Bobby Wellins. We’ve relished writing and arranging together and there’s a wonderful synergy between the quartet. 13. Bassist Steve Watts has played with everyone from Joe Lovano, Django Bates, The Printmakers and most recently The Brotherhood of Breath. A warm sound, utterly dependable feel and supportive vibe, he’s one of the gems of our scene. 14. Drummer Dave Ohm has been by my side musically and personally for the last 17 years and indispensable as both. He co-produced my albums Trapeze and Silhouette and played on last year’s Songbook. Just last month he blew me - and the audience- away with two totally contrasting, equally stunning solos at Ronnie Scott’s with the great Ian Shaw. 15. I’m very excited to present a new collaboration with saxophonist Trish Clowes - a musician I’ve followed and admired for years not least her inexhaustible work on her Emulsion series. A BASCA British Composer Award winner and former BBC Radio 3 New Generation Artist, her very impressive credits include the Royal Festival Hall, broadcasts for BBC 2 Proms Extra, the Royal Northern Sinfonia and writing commissions for the BBC Concert Orchestra. This versatility, not surprisingly, affords her a fluidity across all genres with her beautiful tone, ever fresh improvisations and great team spirit. 16. The Late Show Friday 12 October is actually not that late (9.30pm for 10pm start) but means you can have a very affordable after hours drink in central London and hear some great music. Our quintet show with Trish Clowes is the very fitting finale to this year’s Hang so come and raise a glass with us! 17. Tickets for each of these special shows - from triple bills (Wednesday 10th) to Late night quintets (Friday 12th) - are just £15. A bargain! 18. Pizza Express Jazz Club Soho is a venue close to my heart. An intimate space with great sound and decades of jazz programming history, I spent many nights sat at that bar watching and learning from others before first playing there in 2006. From 2010-2014 we famously co-produced my international ReVoice! Festival and now they’ve given me carte blanche again with Hang. Always a homecoming, I’m forever grateful their support has allowed my creativity to flourish and have absolutely loved curating these events.